Annex. Reproduction of a page on "Roading" from the operation database. The New Zealand Forest Code of Practice (FCoP) was first published in 1990, after three years of consultation between LIRO and the forest industry, territorial authorities (councils) and other interest groups. In 1991 a comprehensive new environmental law, the Resource Management Act, was passed by parliament and the FCoP was revised and updated in 1993. The aim of the code is "to plan, manage and carry out forestry operations in a sustainable manner". An overview of forestry in New Zealand, and a short summary of the new environmental legislation, is presented to put the FCoP into context. The content of the code is then more carefully explained. Important to the success of the FCoP is that it has been accepted and endorsed by the forest industry and most territorial authorities. It contains both environmental planning and operational information, is designed for ease of use, and should be a good tool to promote better forestry practices. In about the year 800, when the first Maori people arrived from Polynesia, forest covered over 75% of New Zealand. The Maori people burned some of this forest, not only to create living space, but also as a hunting technique. When the European colonists starting arriving in considerable numbers not long after the turn of the 19th century, vast areas of native forest were converted into pasture. Pastoral agriculture has been, and continues to be, New Zealand's dominant land use. In 1994, the countries 27 million hectares is predominantly in pasture and arable land (52%) and native forest (23%), 5% is under exotic forest and the remaining 20% under mountains, water bodies, cropland and urban areas. 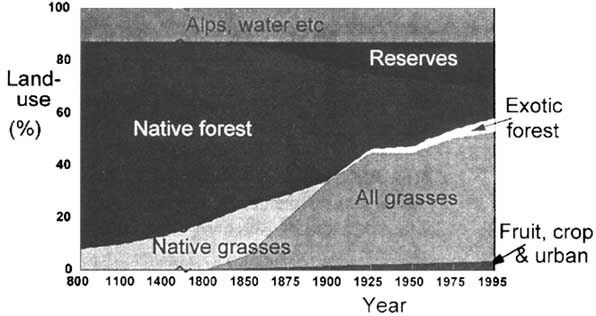 A summary of the history of land-use change in New Zealand is illustrated in Figure 1. State-organised planting of production (exotic) forests began in the late 1920s (depression years), particularly on volcanic plateaux where pastoral farming was marginal. The Kaingaroa Forest between Rotorua and Taupo is a good example of the extensive planting of this time; over 100,000 hectares of continuous exotic plantation forest. A number of factors have combined over the last thirty years to encourage further planting, including: the need to stabilise eroding farmland; an increase in log prices; and improved harvesting techniques and efficiencies. In 1994, an additional 100,000 hectares were planted (in addition to restocking), most of it on relatively steep farmland. Figure 1. History of land-use in New Zealand. Although in the early years many different tree species were planted, experimentation showed that Pinus radiata (also known as Monterey Pine, originally from California) excelled in the New Zealand conditions. With continual genetic improvement, Pinus radiata continues to out-produce any other species by far, accounting for 90% of our 1.4 million hectares in exotic trees (other main species include 5% Douglas-fir and almost 2% Eucalypts). With an average growth rate of 24 m3/ha/yr, a single tree will grow to 35 metres in 30 years, yielding 2.4 m3 of timber. Nearly all of our pine forests are clearcut harvest at age 30 (Douglas-fir at age 50). The current annual harvested volume is 16 million m3/yra. It is important to note that close to 99% of the volume of timber harvested in New Zealand comes from these exotic plantations. An encouraging trend for the environmentalists is that more of our remaining native forests are permanently being protected through park and reserve status, and the remainder through legislation. a All data are from Forestry Facts & Figures, 1994, published by the New Zealand Forest Owners Association and the Ministry of Forestry. The more traditional, and still the most common way of harvesting is using ground based machinery. A typical ground-based operations might consist of a gang of eight people, operating a skidder or a tractor and a loader/fleeter, being able to harvest on average about 260 tonnes per day. The total extraction cost for such an operation is usually between NZ$ 10 to $12 (about US$ 8). Expansion onto steeper land in recent decades has meant that 35% of all harvesting is now carried out using cable systems. An average cable harvesting gang of 10 people, with a hauler, processor and loader/fleeter, can harvest about 200 tonnes per day (extraction cost NZ$ 18 to $20). The New Zealand Government recently introduced the Resource Management Act 1991 (RMA). This Act replaces nearly all other resource and land, air and water related laws. The main aim of the RMA is to "promote the sustainable management of natural and physical resources". The RMA is an effects-based resource law, focusing on the activities which cause adverse environmental effects. Consequently, forestry cannot be regulated as an industry: what goes for forestry must apply to all land-users. The definition of sustainability used in the Act includes "providing for social, economic and cultural well-being". Although the RMA lists several matters of national importance, it is otherwise very vague on what to protect, and how to provide this protection. The balancing act between resource development and conservation is left up to the regional councils (13) and district councils (84), who are expected to implement the RMA. As there is no explicit forestry law in New Zealand, any specific regulations are expected to be developed by the councils. The effectiveness of the law is intended to, come from the direct liability it places on people involved in resource management, as the Act states that "every person has a duty to avoid, remedy or mitigate adverse impacts". Fines of up to NZ$ 200,000, and two year jail terms can be imposed for non-compliance. There is expected to be a clear chain of instruction/command between company management and workers, and ultimately the responsibility lies with the land owners and company management. The aim of the LIRO NZ Forest Code of Practice (FCoP) is "to plan, manage and carry out forestry operations in a sustainable manner", and this is closely aligned with the purpose of the RMA. The FCoP was first published in 1990, after three years of consultative work. It was revised and updated in 1993, primarily because of the introduction of the RMA. The FCoP is intended to be a very practical document for both the environmental planning of forestry operations, and an information base on the forestry operations themselves. The FCoP commences with a page on the beneficial aspects of the relationship between forestry, the environment and the community. The objectives of the FCoP relate to the protection or maintenance of the following ten common production forestry values: soil and water, scenery, cultural, recreation, science and ecology, forest health, site productivity, off-site impacts, safety, and commercial viability. This list is not intended to be exhaustive, but should provide a useful starting point for addressing specific issues. Thorough environmental planning is considered to be the key to achieving the best possible environmental outcome. Figure 2 shows the Environmental Planning procedure as outlined in the FCoP (use of the Code section), in addition to indicating where the other sections of the code are to be used. Minimising adverse effects of operations starts in the planning phase through clear and systematic identification of values. The Objectives section of the FCoP lists ten common values related to production forestry. These common values are not always present, but by consultation with a wide range of local interest groups, the important site-specific values can be recognised. Considering how operations might impact on the identified values can be achieved through a systematic matrix checklist such as the one provided in the FCoP (Figures 3 and 4). The checklist is designed for easy use in the field, which can highlight operations with potentially high impacts at an early stage. It is not intended to substitute for a comprehensive environmental plan for the whole forest, but to provide site specific information. Figure 3 shows how operations are rated using the FCoP checklist. The + and - indicate an expected positive or negative effect respectively. Table 2 is an example checklist from a Wairarapa woodlot. By consulting the landowner, Department of Conservation, Fish and Game Council and the Regional Council, the values of water quality, wetland areas, slope stability, erosion and domestic water supply were established for the site. The checklist is then systematically filled out to highlight areas of concern relative to the identified values for this woodlot. From the checklist, for example, we see that felling of the woodlot will potentially be very beneficial in the short term for slope stability. This is because many of the larger trees are starting to fall or slide on the slopes creating erosion scars. Similarly, reading and tracking could potentially give significant long term adverse impacts on water quality, highlighting the need for careful road and track location. Road maintenance and oversowing are highlighted as measures which could mitigate impacts on water quality. Table 2. Example checklist for a Wairarapa woodlot. Mitigation methods or techniques must be implemented by forest managers and supervisors and carried out by individual operators. The FCoP Operations Database contains detailed information that helps identify risks associated with certain operations. It lists key consideration factors for the stages of forest development: access, land preparation, establishment, tending, protection, and harvesting. For each stage the range of methods available to undertake the operation, the potential adverse impacts, and methods for reducing those adverse impacts are listed. Annexed to this paper is a copy of one page on Roading from the Operation Database. In addition to the "Sidecasting & Cut and Fill" technique, "Endhaul" is also discussed in the Roading section. Operations that potentially have a significant impact on the environment, such as earthworks or vegetation removal, can require a resource consent from the district or regional council. It is important to ensure the correct approvals have been obtained prior to commencing operations. Performance monitoring is expected to be the last step essential for achieving the best possible outcome. Post-operational monitoring will help ensure that adverse effects on the identified values have been minimised. Implemented alongside a regular maintenance program, monitoring can continue to protect the site values, and prevent possible problems. A common example of inadequate post-harvest management is poor road, track and landing maintenance. Failure to check-up on a regular basis is often the reason for continued erosion and water quality problems. New Zealand has built a very successful, intensively managed exotic forest industry. The key to its future success will be to ensure all aspects of forestry have low impacts on both the environment and the community. The LIRO New Zealand Forest Code of Practice is an environmental planning and operational guideline document designed to aid that process, and has been accepted by the forest industry and territorial authorities. It is intended to be a dynamic set of guidelines, encompassing new information in periodic review that, as a final goal, will lead to the 'sustainable management' of New Zealand's planted forestry resource. For forestry to meet all of its requirements for sustainable management as set out in our law, the Resource Management Act, it must "avoid, remedy or mitigate" any adverse environmental impacts. People managing, planning or carrying out forestry operations must have access to information on how to achieve this goal. Presenting this information in the form of non-prescriptive guidelines places the emphasis on correct implementation of protection measures to protect the values at that site. Vaughan, L., Visser, R., and Smith, M. 1993. New Zealand Forest Code of Practice, Second Edition. Published by the Logging Industry Research Organisation, PO Box 147, Rotorua, New Zealand. Sidecasting is the least costly and most commonly used technique for roading. Road surfacing may be necessary, factors to consider are compaction, drainage, subsurface binding properties and gradient. Cut and fill techniques are used on steep or broken terrain, where surplus material can be moved short distances to provide fill.